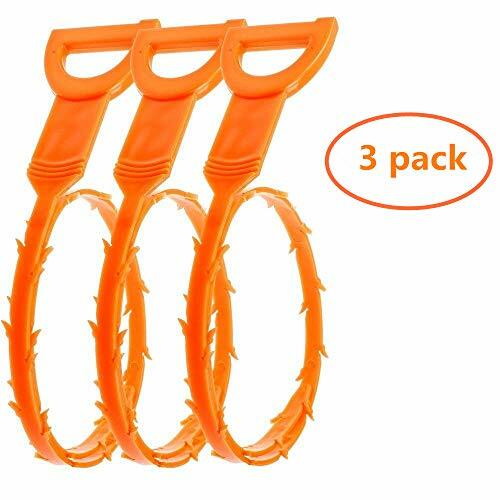 Special design of drain cleaner: flexible and bendable spring loaded cable with easy comfortable grip handle on top and heavy duty steel spring and retractable claws on the bottom, which make this grabber tool accessible to most hard to reach narrow bended places. This drain hair catcher widely used for cleaning bathrooms, sinks, tubs, and dredging pipe, drain, sewers and other places clogged often. Quick and easy to clear slow-moving or clogged drains. 1.No need of expensive dredging tool. 1.Keep in safe areas where is out of children's reach. 2.Please do protect your eyes well when using the product.